Take your chickens and run before other farmers get your spot! 2 teams of chicken farmers battle to align their chickens. 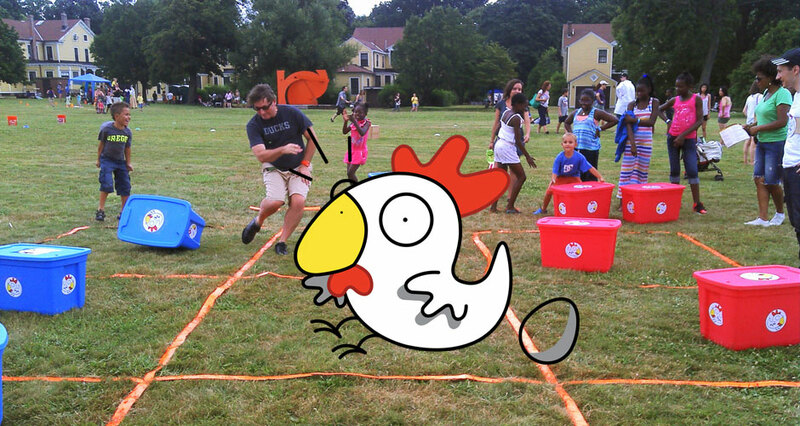 A farmer can either occupy a spot with a chicken, or get others’ chicken off the field. Huan Ling Chen is an artist with a background in exhibition design and games. Her practice addresses public spaces, physical movements and playful relationship. Her work can be found in New York, Rotterdam and Shanghai. Thomas Duc is an artist who likes to alter perceptions of space, ownership and self­-image. He glues together electronics, street elements and game algorithms. He created ecosystems of play in Holland, Taiwan, and the USA.